Preferred Customer Autoship orders of $99 or more receive FREE GROUND SHIPPING! A new page will open onto our secure Reliv Corporate website. 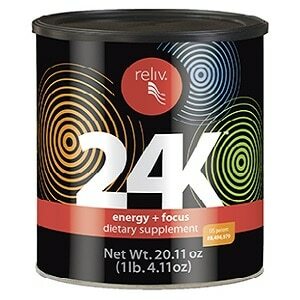 Reliv 24K contains 24 powerful ingredients and is formulated synergistically to tap into your body’s natural vitality. for healthy, real and sustained energy. Zero caffeine! Zero sugar! Zero crash! A U.S. Patent There’s only one Reliv 24K. No sugar and only 20 calories You’ll avoid an unhealthy artificial lift — and inevitable crash. Omega-3 fatty acids, proven to provide multiple cognitive benefits Better focus right now and better memory later. Resveratrol, shown to improve blood flow to the brain You will combat “brain fog” with improved performance and focus. B vitamins, essential to cellular metabolism and energy production It provides healthy, stimulant-free energy. Beta Alanine, an amino acid that boosts the synthesis of carnosine in muscle fibers It reduces fatigue and improves strength and endurance. Coenzyme Q10, a brain-enhancing nutrient vital to energy production Your body will more readily convert carbohydrates and fats into energy. Valerian root, a botanical shown to produce energy without jitters You’ll experience “alert relaxation” as your body is relieved of stress. Gamma Aminobutyric Acid (GABA), a neurotransmitter that controls the brain’s theta waves It increases endorphins and reduces anxiety. 24 active ingredients You get a synergistic formula that supports healthy energy for body, mind and spirit.